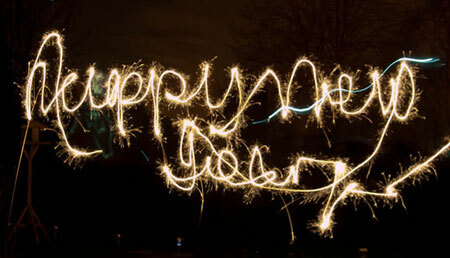 I was intending writing Happy New Year with a sparkler for my last photo365. But I’m going to be rather busy this evening so I thought I’d have a go now as it’s technically the last day, even though it’s only half one in the morning! So I set the Olympus E-P2 up on a tripod and used a torch to help focus on the bird table which will be at a similar distance to me. And then I set the 14-42mm to wide angle to ensure a good space. I did a few practice dry runs writing the message. The camera was set to manual exposure and a 30second shutter speed and f5 aperture. I set the timer to 12 seconds to give me enough time to light the sparkler and then position myself ready in front of the camera. In my few attempts I found it hard to write the three words clearly. 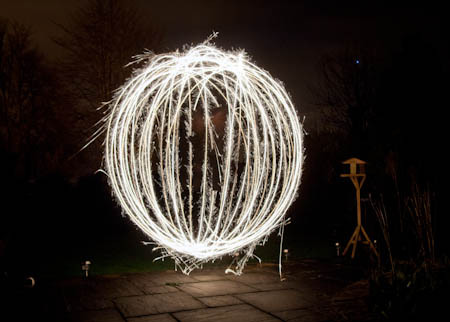 So I decided to try the wire wool light orb technique, using a sparkler instead of wool. I attached one to a piece of string and made a knot in the string so I knew where to hold it. A few test shots and I worked out that a 20sec exposure was enough time to do a complete orb…and I’m quite pleased with the result. In the New Year I will combine the orb technique with a star trail and painting with light. Well that’s it for me…one picture every day for the last year. I nearly gave up several times, but can now feel proud of my achievement, thanks for viewing. In 2011 I have taken 17699 photographs (many more if you count those I have deleted along the way) That’s equivalent to nearly 492 rolls of 36 exposure film – nine rolls per week. It’s the most I’ve ever taken in my 30 years as a photographer. While many of the photos were taken near or in my home I’m pleased with the variety, especially as I lead a busy work life. Happy New Year everyone and thanks for your contribution in making ePHOTOzine a success.